While marketing professional services has challenges that differentiate it from product-centric marketing, they do share certain commonalities. Whether buying a widget, engaging a consulting firm to improve a critical process, or hiring counsel for legal advice, the way in which prospects engage in the decision process is very similar. To risk oversimplification, in each case, the prospective client will begin with (i) awareness of a challenge, and will then (ii) seek information, (iii) consider alternatives, (iv) purchase, and finally, (v) make post purchase evaluations. In this buying process (often referenced as the "sales funnel" or "buyer's journey" depending on your perspective) prospects will use similar tools and methods to inform their decision: colleagues, friends, the internet, and lastly (unfortunately), the service provider themselves. How will you engage at that crucial first “awareness” phase? A critical difference however is that challenges (and their causes) are not always as self-evident in services-based environments as they tend to be in product-centric ones. Sellers of widgets proactively manufacture their product to accommodate what they believe to be a universally (in terms of market segment) understood need with a commonly agreed to solution. Beverage companies know there is a large market composed of people who get thirsty (need), so they manufacture an assortment of beverages (solution). With the exception of the most bespoke products, or customizations for large clients, vendors and manufacturers read and engage markets, not individual consumers (focus groups notwithstanding). The consumers collectively create the market of course, and the vendor plays to the law of averages needing to capture the biggest potential market share. The client in this instance is a hypothetical construct: an en masse "buyers' personae," if you will. A distillation of market analysis, incomplete information, and experience. 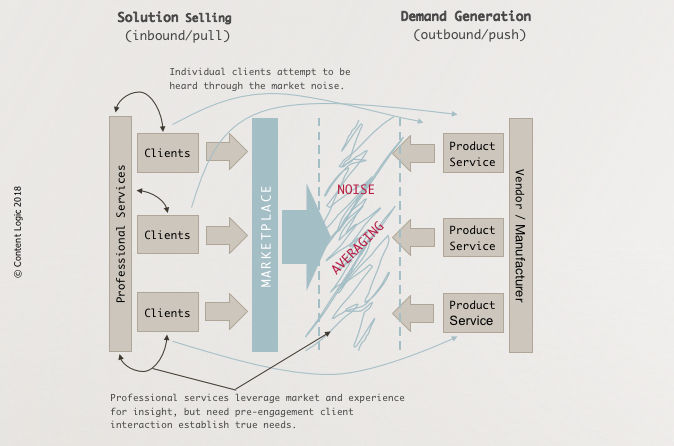 The professional lives – needs to live – on the individual client's side of the market dynamic. Advisors cannot deal in averages and rely on market constructs alone. They deal with specifics. Audit reports, legal advice, technology implementations, and medical diagnoses are not delivered on the average of all clients in the respective market, but rather based on the individual circumstances and guided by experience. As Jack Welch famously articulated a fundamental 6-sigma concept: No individual experiences an average. As we know, the typical decision process puts interactions with potential service providers dead last. By the time the potential service provider gets an audience, the prospective client has: identified a challenge (often misidentified); sought information and self-educated primarily using the internet (often misdirected and misleading); narrowed possible alternatives, and then issues an RFP. All based on potentially bad data or none at all (see Dilbert™ above). This creates a challenging market dynamic for the professional services provider. However, the similarity to the buyer's decision process in the purchasing of services mean many concepts used in product marketing such as the “buyer's journey," "buyer's personae," and of course excellent content writing technique, are useful to the service professional too. In fact, absent the framework of these concepts and understanding how your target audience engages, you are likely to experience disappointing results. In other words, a content-based marketing framework is appropriate. This is true whether you call your efforts rainmaking or sales; call your prospects customers, clients, or patients; or your sales force business development managers, sales engineers, or partners. Exploring these concepts and how to apply them to marketing professional services are key touchstones in a Content Logic consulting engagement. To increase the client base and cross-sell, professional services organizations historically rely heavily on organic growth. Relationship development (not unwisely) is front and center. But what happens when you run out of college roommates, friends, family and existing clients? As inspiring as growth by word-of-mouth is, it too has limitations an organization may wish to move beyond to increase market share or move into new markets. And precisely what are relationships built upon? Friendship? Collegiality? Only in part. You must be a trusted friend or colleague. And in this context, "trusted" means trusted to do an expert job. The stakes are simply too high, and reputations can be on the line. Apologies to the ne’er-do-well brother-in-law. So, in this context, how do you develop trust with someone you've never met? How do you find each other? How do you engage at that crucial first “awareness” phase of the buyer’s journey when you can have the most impact and help frame the debate? This is particularly difficult for those who are new market entrants or whose personal or organizational reputation is less known. Thought leadership within the framework of content-based marketing is the way. It is not enough to deliver expertise. It must be well-placed to be well received. In other words, the content must align to the phases of the buyer's journey if it is to be relevant and effective. Furthermore, it must be appealing to wide audience. CFOs, COOs, CTOs, purchasing departments, legal, et al – not only the line-of-business owner who will be your client – may be involved. This means you must write with more than professional expertise, you must write with marketing expertise too. This is content logic.